Good internal communication practices are critical to ensuring everyone on your team have the information they need to work towards the same goals. This means when there is important corporate news, new initiatives and projects, new products, new targets, customer service standards, changes to the regulatory environment you work in, new competitors and other threats or unforeseen problems that arise, everyone can be on the same page and understand their role in it. Miscommunication or lack of communication can cause problems when there is lack of clarity and a lack of direction. This can spill over to affect your clients and other stakeholders and how they perceive your business. Improved communication internally can solve this, and can also boost employee engagement and staff retention rates. Internal communication is, of course, a two-way street and shouldn’t just be a top-down management to employee approach. Employees too should have a way of giving input and communicating with their employer. When employees are given the opportunity to see that their ideas matter, they feel more valued. Happy employees are often around 12 per cent more productive than unhappy ones. In a traditional workplace, communicating with employees is much more straight forward. If everyone is working from the one office building, working 9-5, finding ways to communicate with them is not overly challenging. Modern organizations, however, don’t always work this way and the ways that employees work, if not accounted for, can lead to many people feeling disconnected and isolated from their employer. Your company may be a multinational with offices spread in different cities around the globe, in different time zones, speaking different languages. Or perhaps you just have them in different cities around your country. Flexible working arrangements for people seeking more work/life balance and the way technology has changed our lives mean many people work remotely from home (or on the beach, or in coffee shops) and don’t actually work from a traditional office environment. Some occupations might mean that many employees are out on the road all the time and spend little-to-no time in the office in front of a computer. Or perhaps the workplace itself is a retail outlet or café or building site where employees don’t access email on their computers all day long. How do you reach these employees to ensure that they are kept in the loop with your corporate communications efforts? DeskAlerts is an innovative internal communications solution that is revolutionizing the way many companies around the globe communicate with their employees. The foundation of the DeskAlerts system is sending pop-up notifications to employees’ desktop computers to ensure that they never miss any important company information. But when you have workforces working remotely or on the field or not using computers at all as part of their jobs, reaching these people still poses a challenge. DeskAlerts developed an app for smartphones and tablets to specifically address this issue, closing the loop and ensuring that these employees receive all the same information that those in an office getting pop-up notifications on their computer screens would get. The app is available from both the Google Play and App stores and works on Android and iOs devices. Employees who have it installed on their devices receive the DeskAlerts messages in the form of “push notifications” that appear on their screens letting them know there is a new message. No matter what the time zone is that your employee is working in, no matter if they are on the road, in a coffee shop, sitting in an airport waiting for the next flight, working from home or working on a building site you should be able to reach them so long as they are connected to the internet. Being able to deliver rich content including video, images and HTML links to read further information. Sending to targeted groups of users, for example employees who work on a particular project or employees located in a particular geographic region. The ability to get out time-sensitive, critical information to everyone who needs to know about it to alert them to a major issue or emergency situation very quickly, at the push of a button. Sending RSVPs to important corporate events or training and getting information in return, such as dietary requirements or suggestions of alternative dates, from the invitees. Sending surveys, quizzes and polls for a variety of purposes – from measuring staff satisfaction and engagement through to finding out how much information they have retained from a recent training exercise. DeskAlerts is powered by a user dashboard where you create messges to send to your employees. When creating new messages, the administrator can select to deliver them via push notification to those employees who have downloaded and installed the app. Messages are then simultaneously sent to desktop computers and to the smartphones and tablets of those who have the app installed. 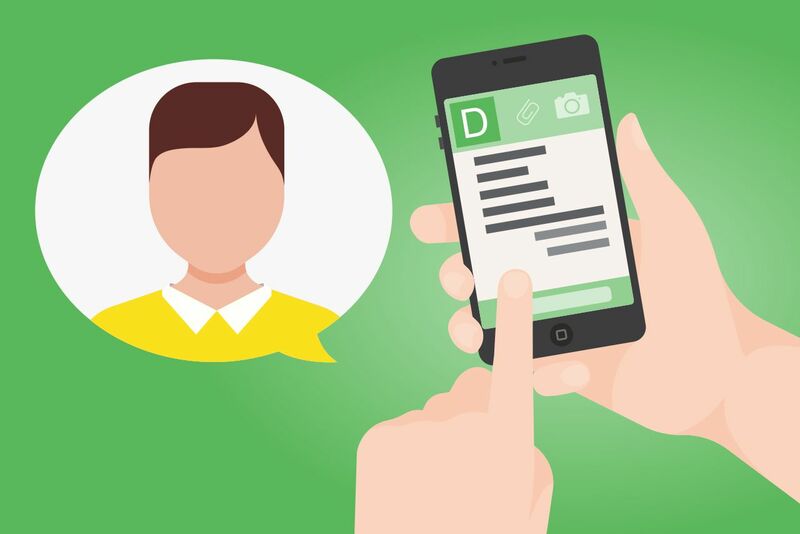 Any messages you send to the employees who have the smartphone app will adapt to the specific screen it is being viewed on and will be fully visible displaying both text and pictures as well as titles and logos. There is also a confirmation button that the user must press. If you want to check to see who has seen your messages, you can quickly and easily do this through a statistics module in the DeskAerts dashboard which will show which alerts have been received and confirmed and by whom.